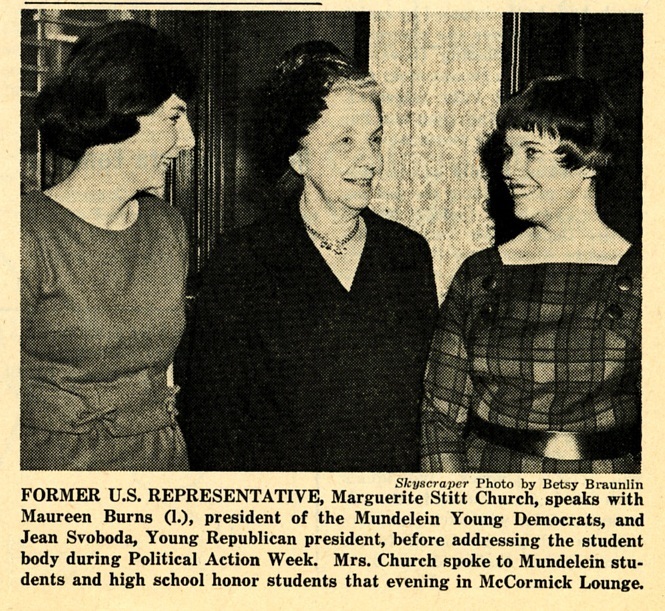 Former U.S. Representative, Marguerite Stitt Church, speaks with Maureen Burns (L), President of the Mundelein College Young Democrats, and Jean Svoboda, Young Republicans President. Skyscraper, February 26, 1964. 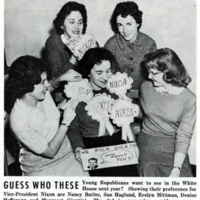 Members of the Young Republicans show their support for Richard Nixon's political candidacy. Skyscraper, March 2, 1960. 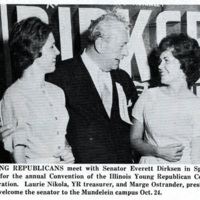 Young Republicans meet with Senator Everett Dirksen at the Convention of the Illinois Young Republican College Federation. Skyscraper, September 26, 1962. 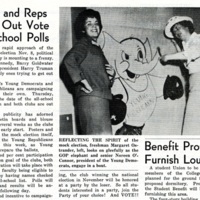 "Dems and Reps Bring Out Vote At School Polls," Skyscraper, October 19, 1960. 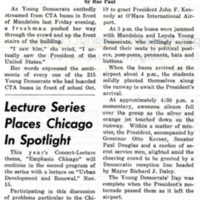 "YD's Greet President at O'Hare Airport," Skyscraper, October 31, 1962. 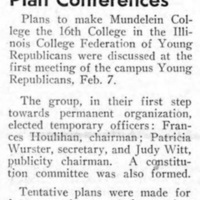 "Young Republicans Choose Officers, Plan Conferences" Skyscraper, February 17, 1958. Student clubs like the Young Democrats and Young Republicans, established at Mundelein in 1957, raised awareness about partisan politics on campus while also offering opportunities to participate in government activities off campus. On campus, students organized voter drives. Off-campus, they represented their college at political rallies and attended national mock government conferences with fellow undergraduates. The two groups even met at the same time--4:10 pm on Tuesdays.